Biologic contamination can have a negative impact on a wide range of industries and applications including medical diagnostics, oil and gas production, refining, chemical process, semiconductor, waste water, cooling water and physical plant systems. Bio-activity not only disrupts test results in medical diagnostics and HPLC analysis, a bio active environment can cause corrosion in plant systems, degrade oil and gas feedstock quality and foul wastewater and cooling water systems. Bio contamination can cause real damage to the bottom line. That's why it's important to test for and control biological contamination, and why selecting a bio-inert surface is an important factor to consider when designing a sample transport system. A bio-inert surface assures adequate detection and selectivity is achieved when testing for biologics. How Dursan is NSF approved and FDA compliant. How Dursan is an important coating to consider when selecting a corrosion resistant and bio-inert material. Stainless steel, a common medical diagnostic flow path material, is an active surface that can cause protein retention, chemical adsorption and is susceptible to corrosion when bleach or acids are used as a cleaning or rinse agent. That’s why various types of coatings have been used to improve the surface properties of medical diagnostic instruments for decades, but few have been completely successful in reducing protein retention and carryover. Get our latest e-book on bio inert coatings. Instrument manufacturers have gone to great lengths to evaluate alternative materials to solve non-specific protein binding, protein carryover, fouling and rust problems. Unfortunately, commonly used fluoroploymers, like AF1600, are not acceptable in high durability applications. Small bore surfaces like needles, valves, or fittings are also challenging for polymer-based or other line-of-sight surface treatments. To address durability and form factor concerns, manufacturers take into account several key factors when selecting bio-inert materials. Dursan® meets all the criteria and is NSF and FDA compliant; making it worth consideration when selecting a bio-inert material. Our Dursan® coating is compliant with NSF/ANSI 51 and all applicable requirements. That means that it is safe for food contact and also meets the FDA’s requirements for compliance. FDA regulates coatings via the Code of Federal Regulations (CFR), specifically 21 CFR 175.300 which lists what raw materials are acceptable and unacceptable for the formulation of coatings. 1. Pass the solvent extraction tests listed in 21 CFR 175.300. 2. Contain no heavy metals. 3. All coating components must conform to the materials listed by the FDA in order to be compliant. These stipulations are also required for NSF/ANSI 51 certification. Dursan® successfully meets these requirements. 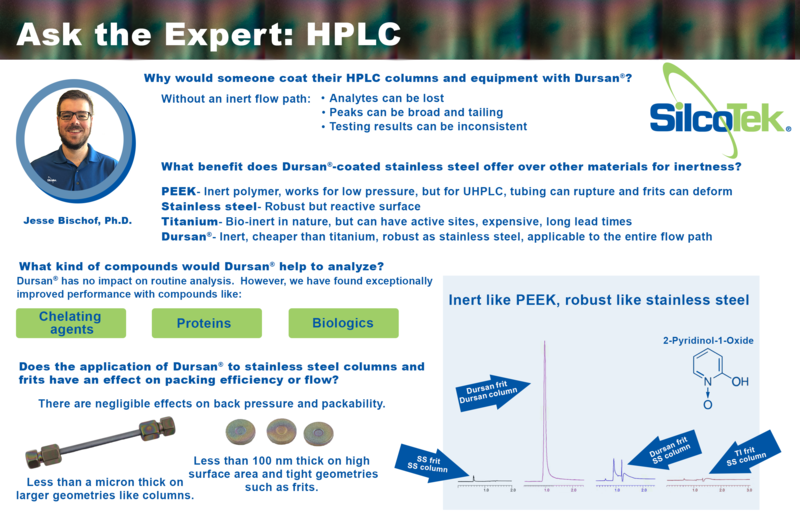 Why is Dursan® Ideal for Bio separations and Medical Diagnostics? A bio-inert sampling flow path is critical for achieving consistent bio separations in medical diagnostics and HPLC analysis. Over time inert surfaces degrade and test flow paths corrode due to frequent rinse cycles from aggressive chemicals like bleach. The corroded and pitted surfaces are perfect hiding places for sticky compounds and bio growth, making carryover and contamination a real concern. We tested Dursan vs. a common stainless steel coating to evaluate the corrosion resistance when exposed to bleach. 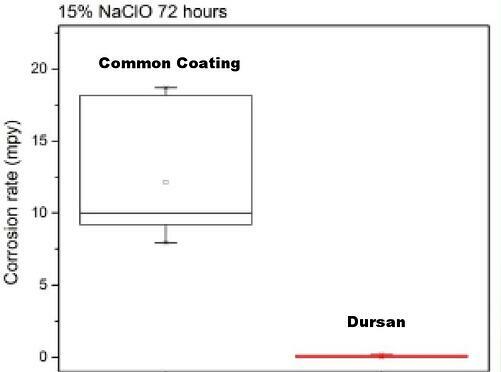 After immersion in 15% bleach for 24 hours we found the Dursan coated surface outperformed most coatings and exhibited impressive corrosion resistance. Get our latest corrosion solutions presentation to learn more about how our coatings improve flow path corrosion resistance. How do coatings benefit medical diagnostic and bio separation components? The bio-inert Dursan® prevents interaction of reactive, corrosive, or sticky compounds in analytical flow paths. 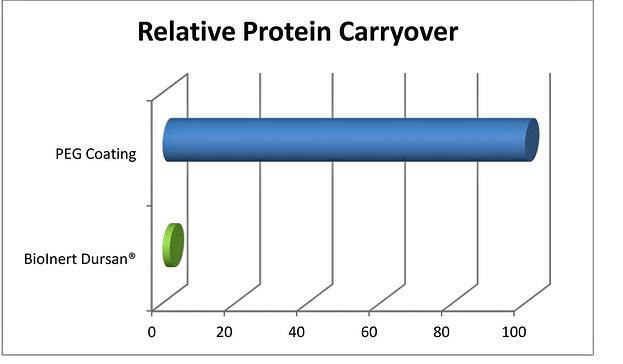 We compared the performance of Dursan to PEG coatings and found that Dursan significantly reduced the relative protein carryover. Preventing sticking of biologics and improving test accuracy and reliability. 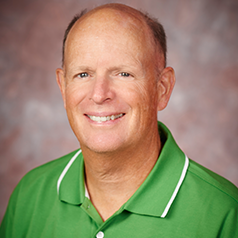 Want to learn more about how coatings can help prevent bio contamination and improve test results? Ask the experts, we're here to help you pick the best coating for your application.